The plug-and-play and maintenance-free Magic Wall LED gaming units offer games and video in the tightest spaces. Whether in the waiting room, indoor playground or as an addition to MyKidsCorner. The basic device 19” need a wall space of approx. (H)59cm x (W)57 and sit pround from the wall from 7.5 – 18cm. The sturdy, melamine-coated wooden housing is standardly available with the basic colours raspberry, macchiato, mint and lemon-sorbet. Optionally in many Colours, Wood or Metal finishes like brushed stainless steel.All surfaces used conform to EN71 Part 3 and are saliva, perspiration and food safe in accordance with the guidelines for children’s toys. The latest version 2019 is now equipped with an even larger and more luminous 19-inch zero-bezel touch screen of 42x34cm. 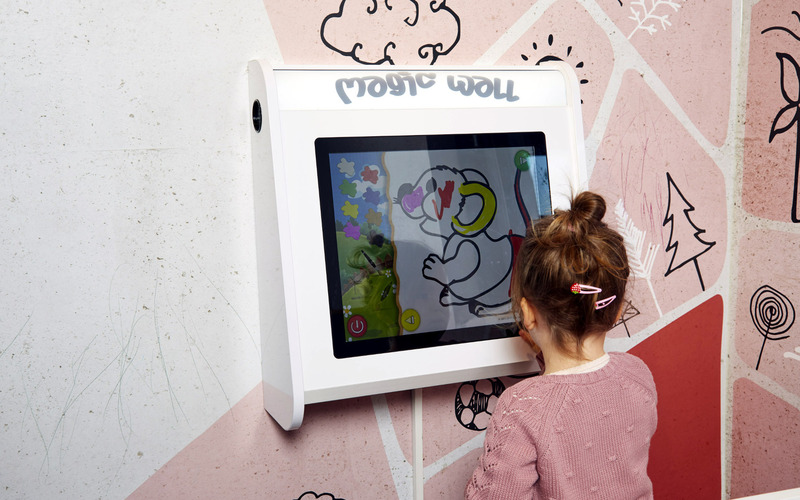 The touchscreen is tilted 10° for optimal operation which allows children of all ages to play while standing or sitting down. The top part of breakable and splinter-proof plastic is provided with background-illuminated LED lettering and lends the new Magic Wall a modern and appealing design. The integrated wall-mounting can be easily and quickly installed anywhere you desire.